My first two pooches today are new arrivals to the shelter, but I’m guessing they are going to find their new home very soon because they are so pretty and so sweet! 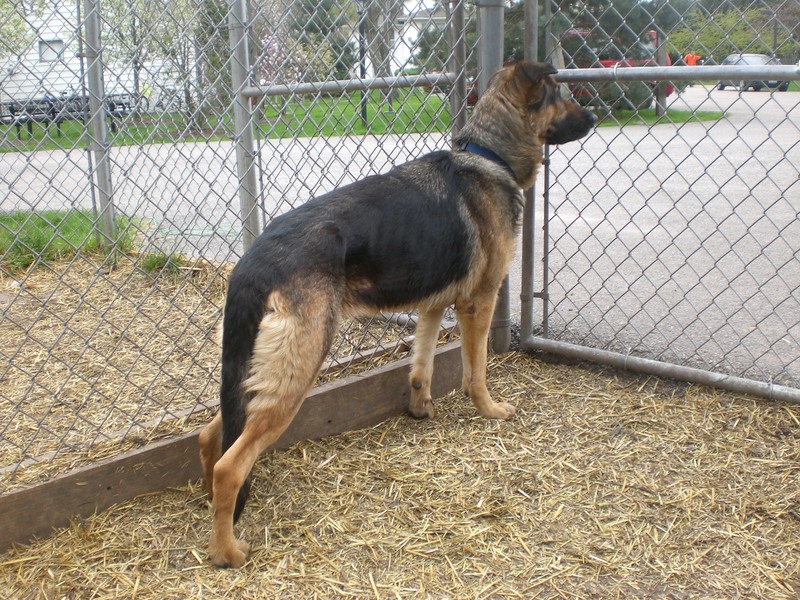 Pumpkin is a seven-year-old German Shepherd mix who unfortunately lost her home and her family. She could use some extra loving so she doesn’t feel so abandoned anymore. She loves getting nice and close, which sometimes involves her jumping up and putting her front paws on you. She’s too sweet to tell her “Off”, though. Pumpkin walks very well on a leash, pulling only when there is an extra-special scent she’s picked up. 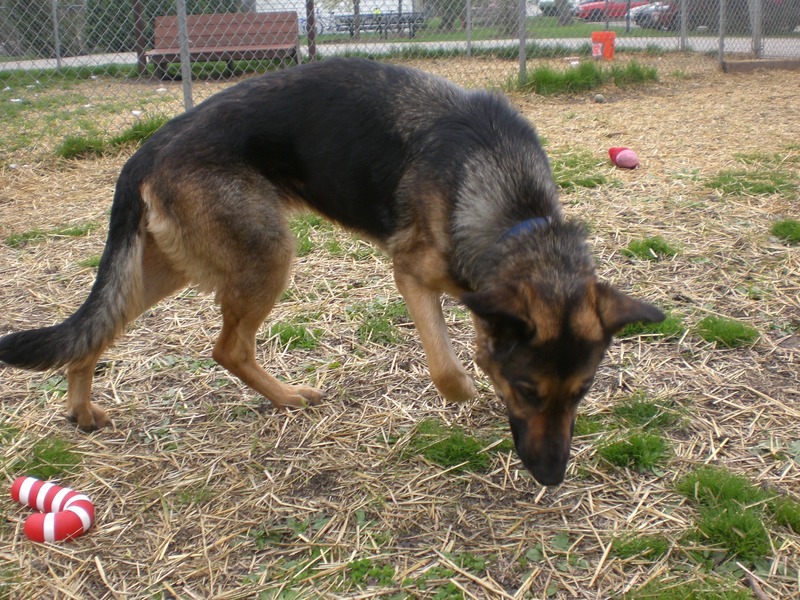 She seemed to prefer walking around on the leash to sniffing around the run, so I walked her around the shelter’s property a few times so she could get her exercise. She would look up at me every so often, as if to make sure I was still there next to her, and I would reach down and pat the top of her head to assure her I was. Look at how gorgeous Pumpkin is! The staff at the shelter kept saying what a wonderful dog Pumpkin is, and I definitely agree. Visit Orphans of the Storm® soon to meet her yourself! Kizzy the seven-year-old Alaskan Malamute has quite a background story! 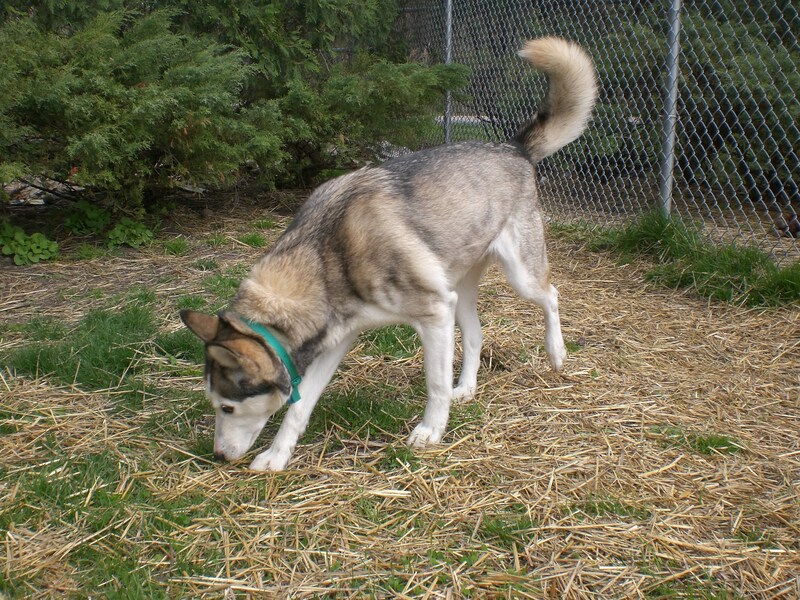 She is a retired sled dog, originally from Alaska. Now that she has gotten older, I’m sure she’s looking forward to settling down and enjoying a quiet retirement. 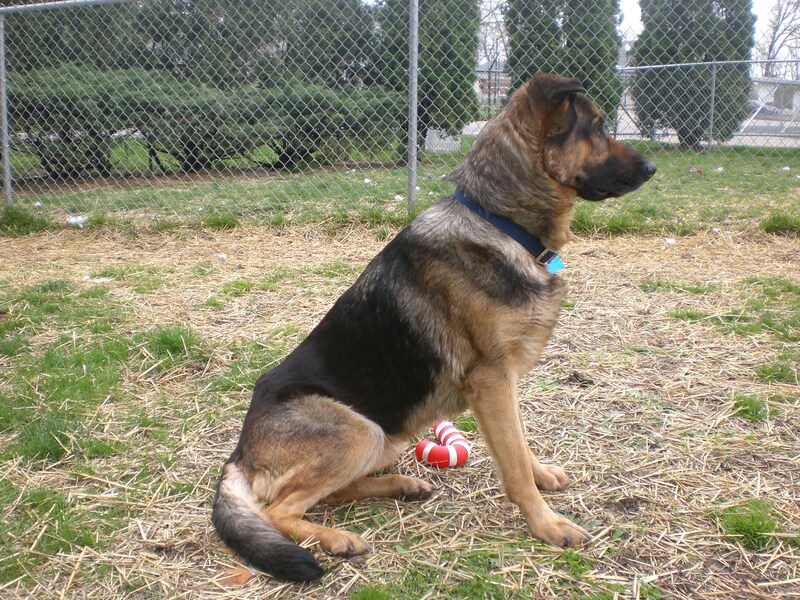 Since she’s a working dog, she’ll still need daily exercise, but you can plan on pampering her too. Kizzy wondering, "Where is the snow?" 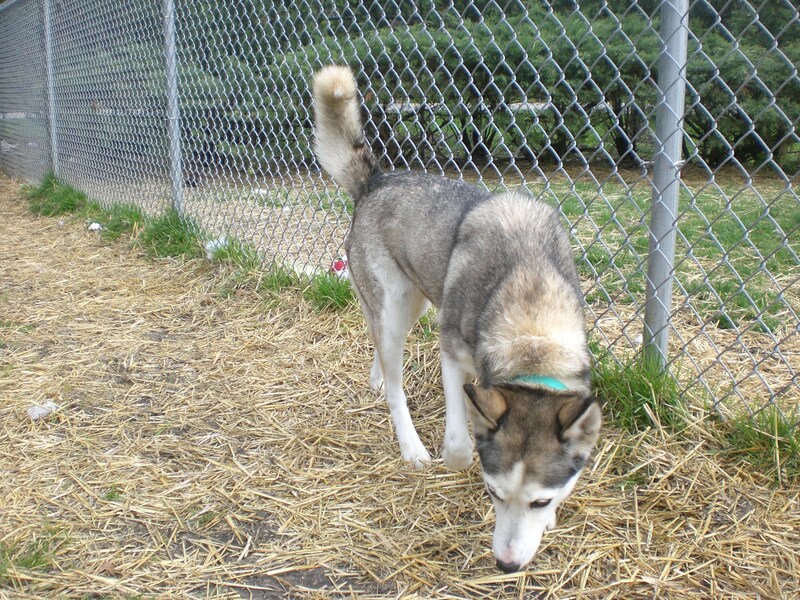 Kizzy is much smaller than I expected her to be, after hearing there was a sled dog at the shelter. She took a few minutes to warm up and approach me, but once she did she was a real sweetheart who loved to sit and be pet, and I loved petting her! That gorgeous coat is even softer than it looks. She even felt comfortable enough to stick her nose right in my face. Even though she’s more used to being in a pack with the other dogs on her team, Kizzy will be happy to have a new human pack to spend her retirement with. It’s safe to assume that she’s a well-trained dog; when I went to put her leash on, she sat down expectantly–probably since she’s so used to getting a sled harness put on. Last up were two Chihuahuas, Mouse and Coco. 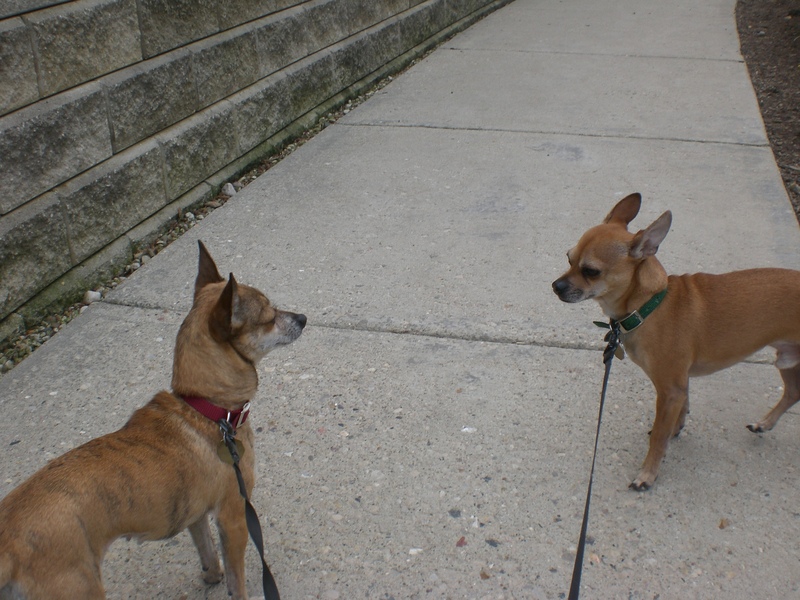 Since Chihuahuas are pretty easy to manage and these two get along well, I took them out for a walk together (side note: they do NOT need to be adopted together; they just both wanted to go outside). 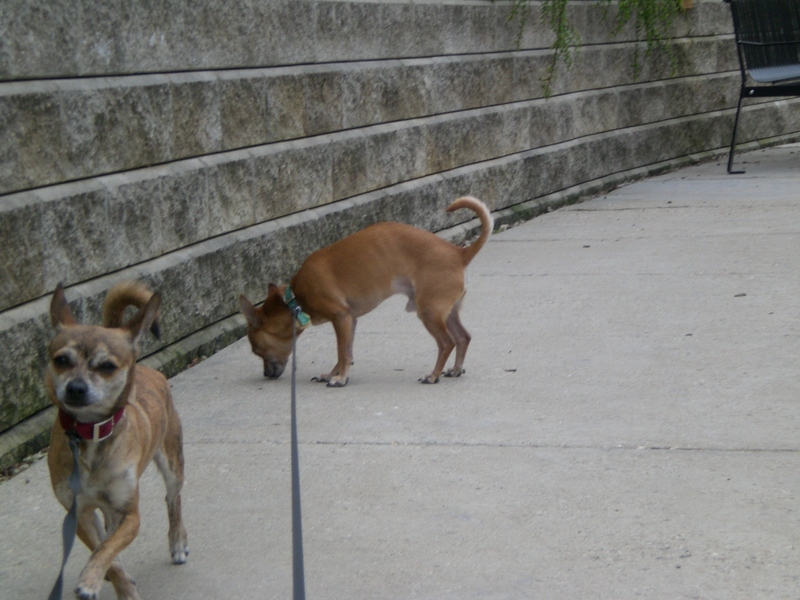 Mouse is a fast walker, and turned around in exasperation when he reached the end of his retractable leash and saw that Coco and I were standing still as Coco sniffed something on the sidewalk. After walking them (or them walking me–I still need more practice walking two dogs simultaneously) for a while, I knelt down to their level. Coco came running back to me and put her tiny front paws up on my leg, eager for me to scratch her head. When Mouse saw what was going on, he came running over too, and put his tiny front paws up on my other leg. Both of these Chihuahuas love getting attention! 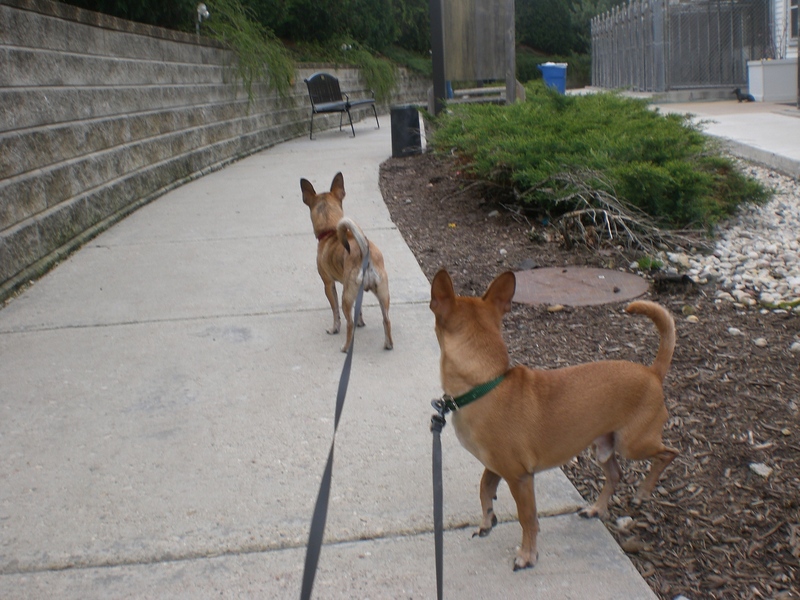 They let me know when they were ready to go back inside by walking back to the shelter’s front door. Both of them are office dogs, so you’ll find them in their own cages by the front desk. Ask a staff member or volunteer to take them out for you, and you’ll discover how happy they can make you! 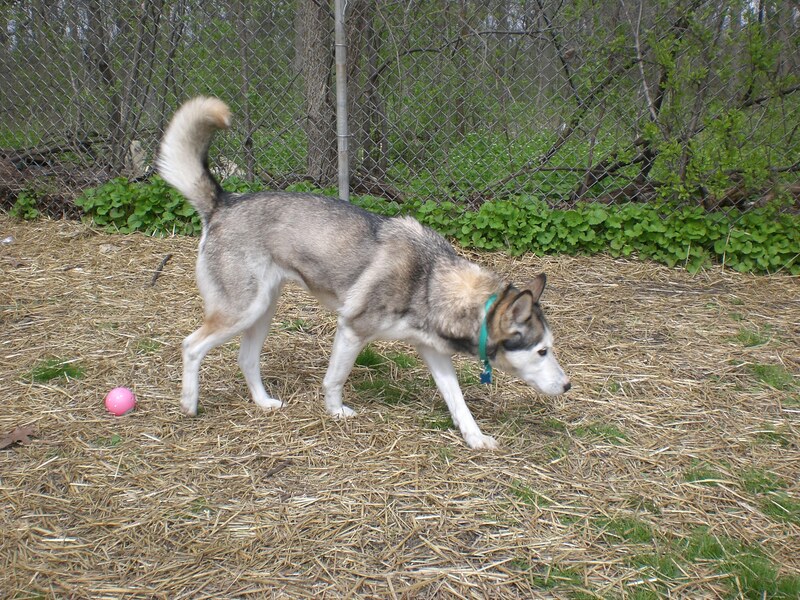 Posted by Meet the Pooches on March 30, 2012 in Dog Profiles and tagged adoption, Alaskan Malamute, animal shelter, Chicago, Chihuahua, dogs, German Shepherd, Orphans of the Storm, pets.